The Sanford’s Elf Owl, like all Elf Owls, is nocturnal. Unlike most raptors the Elf Owl has relatively weak feet, and its talons are not as good for catching prey. For this reason, Elf Owls usually feed on insects and scorpions. Some favorites include caterpillars, centipedes, cicadas, fly larvae, grasshoppers, locusts, and mantids. They have occasionally been known to eat mice, small snakes, and lizards, but this is unusual. Elf Owls most commonly feed at dusk and at dawn.The Elf Owl is known for being fast. Because of their quick speed they are able to take most of their food in the air. This is a sight to behold! The Elf Owl is relatively non-aggressive when compared to other raptors. If they are approached they will generally fly away, as opposed to fight. If they are captured they have also been known to pretend to be dead. When hunting, these owls are seen sitting erect with a “knock-kneed” posture. They will often sit, waiting for potential prey, on cacti, shrubs and trees. 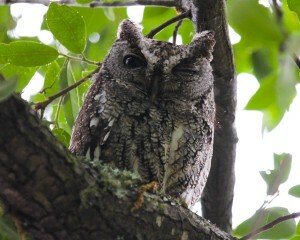 If you do not see an Elf Owl, perhaps you will be lucky enough to hear one! They have several unique vocalizations. 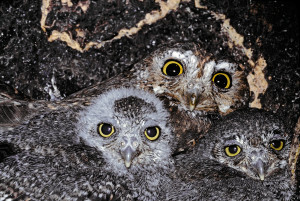 Calls include mating songs by males and females, warning signals, and hunger calls from nestlings. The Sanford’s Elf Owl has a very small range and is only seen in South Baja California. The first documented discovery of the Elf Owl was in 1861 by James Graham Cooper. The scientific name of the Elf Owl “whitneyi” comes from Josiah Dwight Whitney’s name. Josiah Dwight Whitney was the founder of the Harvard School of Mining. Originally all Elf Owls were referred to as the Whitney’s Elf Owl, today that name is reserved only for the nominate subspecies. 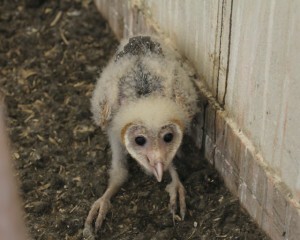 The Elf Owl’s breeding season begins sometime in April. The male initiates breeding by calling out to females from within a cavity. If she approaches, he will pop out and begin singing to her. Females will then select a nesting site. Nesting sites are woodpecker holes created in cacti or trees. The female will lay an average of three eggs and incubation will last for approximately 24 days. Males will often help the female with incubation. Once the babies are hatched males will hunt for food. Once the food is given to the female she will feed the babies. After 28 to 33 days the young will be ready to leave the nest.